At the base of Nevado Huascarán, with 6768 m the highest peak of Peru and tropical areas at all, one can find the village of Ranrahirca on a huge alluvial fan and the town of Yungay slightly elevated a few kilometres farther north. Both are seemingly peacefully embedded in a fine Andean cultural landscape. More than 4000 vertical metres separate the lush valley of the Río Santa and the two ice-clad summits of Huascarán. But what is the reason that Yungay is also known as Ciudad sepultada, which means buried town? And how is this related with Huascarán at a distance of almost 20 kilometres? In 1962 and 1970, this area was the scene of dramatic happenings, which have reshaped the valley and deeply engraved themselves in the mind of the local population. By clicking in the title photo you can change your perspective on Yungay and its surroundings. In 1962, approximately three million m³ of ice and rock broke off from the north peak of Nevado Huascarán. The initial rock fall eroded and entrained a large amount of snow, ice, and debris and evolved into a mud avalanche of 13 million m³, which travelled all the way down to the fan and the village of Ranrahirca. It destroyed part of the village and claimed hundreds or even thousands of lives. In 1970, the same earthquake that destroyed Huaraz triggered a fall of 7.5 million m³ of rock and ice from the same area as in 1962. What could have been the consequences of this event? Yungay, buried under metres of mud and stones, was abandoned and rebuilt in a place farther north. The old Yungay was declared a monument which is known as the Campo Santo, the holy field. Some palms marked with white colour, which survived the event in the shade of the cathedral, remind of the former town, and so do some minor remnants of the cathedral itself, the wreck of a bus, and the cemetery hill. You can walk through the Campo Santo by clicking on the arrows or in the image. 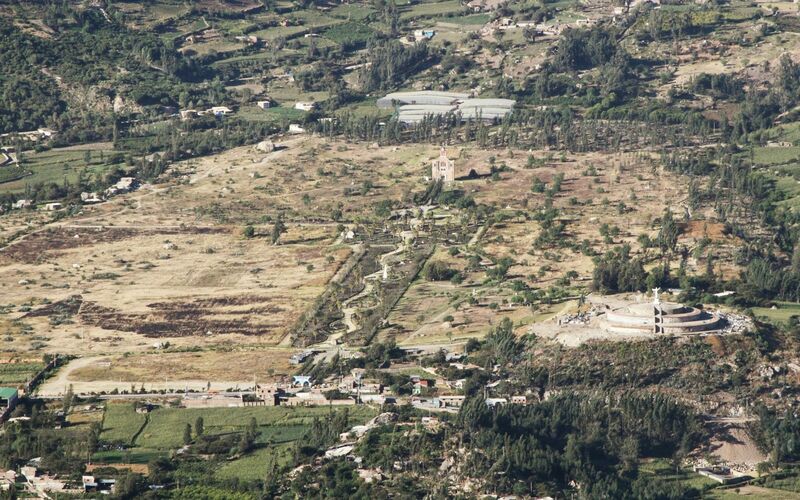 How could the people in Yungay have experienced the disaster of 1970? Try to put yourself in their place and tell your story. What would you do in order to save yourself? Señora Rosa is one of the few survivors of the disaster of 1970. She was 11 year old and spent her time in the Berolina circus at the margin of the town of Yungay, when the earthquake resulted in the collapse of many buildings during the sunny afternoon of 31 May. Three minutes later, through the dust of the destroyed adobe buildings, she saw the landslide appearing above Cerro de Aira. Let Señora Rosa talk about how she experienced the disaster. Señora Rosa further says that, due to the despair after the earthquake and the dust in the air, nobody saw the initial fall of rock and ice. Some people - alerted by a bright-minded barber - could escape to the cemetery hill which was destroyed by the earthquake, but spared by the landslide. Most survivors, however, were in the circus which was spared, too. She talks about the waiting for aid, until it finally arrived, and for the provisional houses which were later built for the survivors.